Functional Art Gallery at NOMAD St. Moritz. Photo by Filippo Bamberghi. Picture the scene: the snow has settled on the peaks in what’s considered to be the most scenic valley in the Swiss Alps. The design fair NOMAD, as the name might suggest, takes place in various locations around the world. The resolutely boutique fair takes up residence in unique buildings in the most glamorous of locations—Monaco St. Moritz so far, and, coming in September of this year, Venice. “Galleries have really sold,” NOMAD co-founder Giorgio Pace says, when I ask him how the fair’s second edition in St. Moritz is going. It’s installed at Chesa Planta, a house with a long history as one of the finest examples of baroque architecture and design in the region. The staging of NOMAD is peerless, with galleries dressing the rooms as simply rooms, rather than standard show booths. The result is several interpretations of an already striking setting complimenting the beautiful objects on display. “This is our greatest success—to make it took not like a fair but rather, an exhibition,” explains Pace. NOMAD is jam-packed with beautiful and exciting art and design, but these are five of some of the most striking items on display over the weekend. Rossella Colombari at NOMAD St. Moritz. Photo byFilippo Bamberghi. You would be excused for knowing Fornasetti for their gorgeous and extremely luxe candles, but during his lifetime Piero Fornasetti was a sculptor, engraver, painter and interior decor. 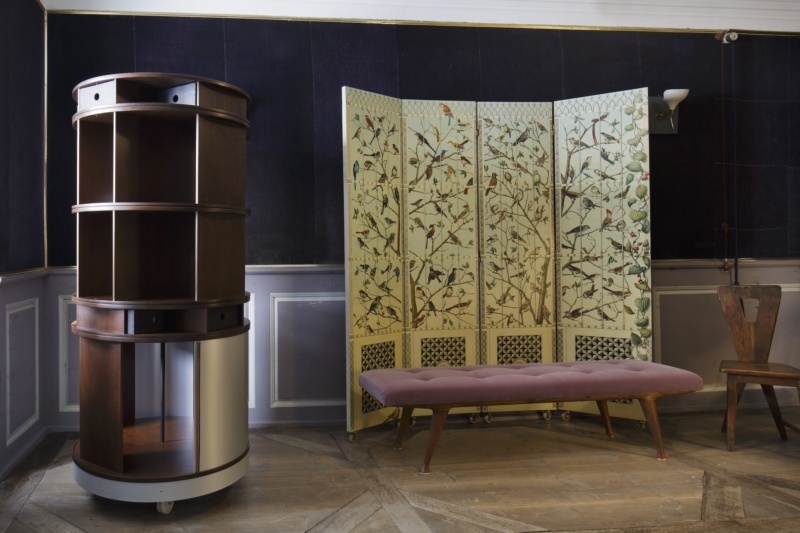 This screen, decorated with exotic birds, is instantly recognizable by way of its famous designer and still stands alone as an object of beauty. Simeti’s booth focused on objects with an element of resistance in their design or meaning. Susan Cianciolo is a fashion designer and artist—she heads the label RUN and makes work using various fabrics, often taking materials belonging to members of her family and stitching them together. This hanging is delicate, but the fact that it’s so deeply personal gives it strength and real presence. Soojin Kang makes her glorious-looking sculptures out of raw silk that arrives to her woven; she un-weaves the fabric and creates her work from these threads. The works defy first glance. They appear rough, but they are soft; they appear to be unravelling, and yet they are re-woven. The subtle beauty and craftsmanship in these sculptures give them a soft power. This exquisite set of chairs combine function and elegance. Part of the Artona collection for Maxalto, they’re a luxury that only a few can afford. With a carved back and wide leather seat, these chairs could be sculptures in their own right without compromising on the comfort you would want from furniture of this price. Simone Crestini’s hand-fired, coral-like, clear glass sculpture appears to be mid-movement, as its tendrils curl into mid-air. This work is an excellent example of how the iconic glass brand embraces young artists and allows them to interact with glass either as a collaboration or, as with this piece, work with the material on their own. This item is particularly unique as it is hand-fired rather than blown.